Tide houses continue to be built and used to protect equipment from the elements. Click the image for a larger view. Advances in technology have helped solve many of the problems associated with the old tidal recording systems. Microprocessor-based technologies allow for customized data collection and have improved measurement accuracy. While older tidal measuring stations used mechanical floats and recorders, a new generation of monitoring stations uses advanced acoustics and electronics. Today's recorders send an audio signal down a half-inch-wide sounding tube and measure the time it takes for the reflected signal to travel back from the water's surface. The sounding tube is mounted inside a 6-inch diameter protective well, which is similar to the old stilling well. A monitoring station attached directly to a pier. Click the image for a larger view. In addition to measuring tidal heights more accurately, the new system also records 11 different oceanographic and meteorological parameters. These include wind speed and direction, water current speed and direction, air and water temperature, and barometric pressure. 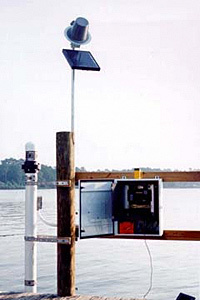 Today, tide monitoring stations are very accurate, require little maintenance, and are part of a larger nationwide network. Click the image for a larger view. Like the old recorders, the new measuring stations collect data every six minutes. However, whereas the old recording stations used mechanical timers to tell them when to take a reading, timing is controlled on the new stations by a Geostationary Operational Environmental Satellite (GOES). The stations also use these satellites to transmit their data hourly to NOAA headquarters. In the event of a storm, the stations can be programmed to transmit their data every six minutes. Field teams can quickly check and maintain the systems using laptop computers. In addition, all of the raw and processed data are available over the Internet.